The Purdue Memorial Union serves as the proverbial crossroads of campus. As students, we pass through it to save time, study in it to get good grades, and dine in the basement to stave off hunger. But there are other things to do in the Union that have nothing to do with food or studying at all. One such thing is bowling. Some students do not know about the Union Rack and Roll in the sub-basement. You can get to the bowling alley by going downstairs near the Purdue Shop and turning left. They’re open until midnight on weeknights and 1 a.m. on Fridays and Saturdays. Another engaging activity offered at the Union is the 1869 Tap Room. The Tap Room is a traditional-style pub named for the year Purdue was founded. It serves as a nod to Indiana’s history with fermentation. In 1806 a settler in Indiana actually set up the first vineyard and brewery in the United States. The Tap Room is open from 4 p.m. to 9 p.m. The Union is a valuable resource that should be taken advantage of. As college reaches a close and the job search begins, the need for a standout resume gets more and more essential. It seems that everyone has a different definition of the way a resume should be written and it is hard to fight through the clutter of information the internet provides. I was one of those students who believed I had an amazing resume. When in reality, my resume was actually holding me back. After being passed over for several internship opportunities, I took my resume into the Purdue CCO office to speak with a career services consultant. I was shocked to find out that a lot of the things I thought I knew about resumes, was false! So to save you the trouble I went through, here are 5 common resume misconceptions. Misconception #1: A small splash of color is good. Reality: Color is a tricky tool to play with when writing a resume. It is one of those tools that you either need to go big or go home. If you find yourself pursuing a job that entails using a lot of creativity, then color can definitely set you apart! But you can use color to show off your skills in design and aesthetics. If you are pursuing a job that is much more analytical or academic, then color should be avoided. Regardless of color, you still want your content to make you unique. Misconception #2: Employers want to know about your high school education. Reality: In the resume world, your high school education is the equivalent of an ex relationship. You are happy to have had that experience because it has gotten you where you are today, but avoid discussing it with anyone new. Most employers assume you did well in high school if you were able to get in to college, so having it on your resume is just wasted space that could be used to describe the experiences and skills you have gained since starting college. Misconception #3: Less information is more. Reality: Companies want to know who you are before you even walk in to interview. If you are worried you are cluttering your resume with too much descriptive content; don’t be! Your resume is an 8.5 by 11 inch paper that is supposed to embody you and your professional skills. The only thing that a brief resume says about you is that you don’t have a lot to bring to the table. Misconception #4: You must stick with standard formatting. a. Drop your font size down to the lowest of 10.5.
b. Decrease your margins to the lowest of .8” on the top and .5” on the left, right and bottom. Misconception #5: Using a resume template is a good idea. Reality: It is sad to say that the majority of us have used a resume template at some point in our lives. Microsoft and the internet make it so easy to do. However, a resume template is basically the kiss of death when it comes to employers! Employers see hundreds of resumes at a time for certain jobs. They KNOW when you use a resume template and the only thing it tells them is that you lack originality. Besides, your experiences are unique and using a template can constrict your ability to elaborate and adjust your resume as you gain more experiences. Want to find out more about what to include (and not include) on your resume? Stop in for summer drop-ins Monday through Friday 10-4 in Young 132 and check out our Resume Rotation for examples. This article was used with permission from the Purdue CCO. This article and others can be found at the Purdue CCO Blog. The CCO is located in Young Hall Room 132. 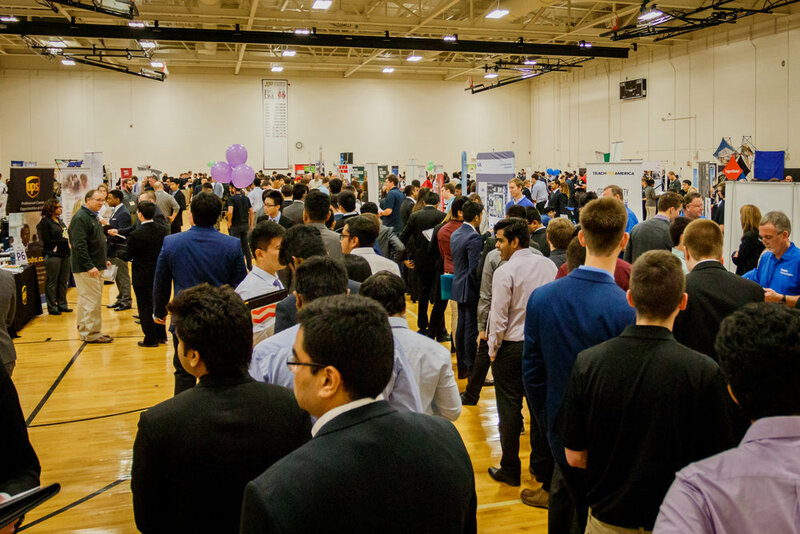 The Purdue Engineering Student Council hosted their 25th annual Spring career fair catered towards Engineering, Science, and Management majors EXPO 2018 this Tuesday the 30th. The event provided students an opportunity to network with 170 potential employers offering internships, co-ops, and full-time positions. Gaining industry experience is one of the best ways for students to boost their appeal to employers before leaving college and entering the workforce. The efforts of PESC and other campus organizations put into hosting career fairs like EXPO is something that benefits thousands of students on our campus every year. Purdue Graduate Student Government and Purdue Student Government's Diversity and Inclusion Committee hosted a Free Speech Panel on January 18th. The evening commenced with an open panel consisting of Purdue's Chief Counsel Steven R. Schultz, Purdue's Vice President for Ethics and Compliance Alysa C. Rollock, FIRE’s Vice President of Policy Reform Azhar Majeed, and Bioethicist and Author Alice Dreger. The panelists fielded questions asked by PSG President Sam Eschker and PGSG President Marcela Martinez. The topics ranged from what does freedom of speech mean at Purdue compared to other universities, what constitutes hate speech, and the relationship between free speech and academic research. Following the panel members of the cabinet of both Student Governments, Purdue Administrators, and the panelists continued the conversation over dinner. This panel was a great opportunity to continue the conversation about free speech at our university, as well as educate students of their rights. We would like to congratulate Ellen Praught and her committee for planning such an important event. Since the launch of our newsletter, many students have reached out to us with questions about its prompting, design, and frequency, among other things. The following questions were provided to us courtesy of Creighton Suter at the Exponent and our answers will give you some insight into the publication. Are the staff writers members of PSG? Yes! They work under the Student Body Press Secretary as part of the Purdue Student Government Board of Directors. What motivated PSG to develop and release a newsletter? Distribution of information to students has become largely decentralized, with colleges and programs each sending their own newsletters to students. These definitely serve an important purpose. Some campus news, however, is important for all students to receive. 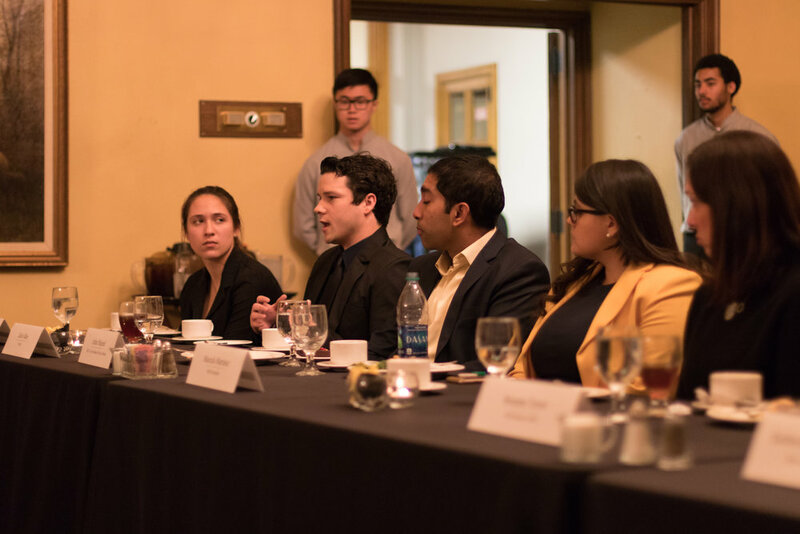 For example, many students would have been unaware that the Industrial Roundtable required registration last Fall, if it weren’t for a last-minute campus-wide email on the matter. This newsletter makes it easier to reach students and to prevent situations like that from arising. Are there any other similar outreach programs PSG plans on undertaking this semester from a communications perspective? We’re treating this newsletter as a new vehicle for outreach. In that vein, we do not have similar undertakings this semester. However, we will continue to be active on social media and encourage all students to follow us on Instagram (@purdue_sg). How often is it going to be published? Right now, our release schedule is every other Wednesday. Is the Boiler Update going to contain any PSG specific news in the future, or is it purely a general, Purdue-wide newsletter? The Boiler Update will contain PSG specific news in the future, but we will always strive to provide coverage of other important campus news. If any campus organizations wish for us cover an upcoming event in the newsletter, they can email PSG at studentgovernment@purdue.edu. With an incredible start to 2018, the Purdue Cheerleading Team dominated in Division 1 co-ed UCA College Nationals. The squad competed in Orlando, Florida from January 11th until January 15. On the 13th, the team competed in semi-finals around 4:30 PM, and found out about their victory that night, at 6 PM. After being deemed champions, they had their final third performance that night for an ESPN recording. As one can imagine, the energy of Purdue’s Cheer Team was unbelievable. The team was led by captains Taylor Scheid, Nina Deligio, and Gunther Balensiefer. The team spirit was high since day one of the season. The last two years, the Boilers have come close with getting second place, but this year was different. The athletes were determined and hungry to win. Heather Bozman, junior on the team, explained “From the opening tumbling the energy began, and then it continued to build from the first stunt, to the cheer, all the way to the ending pyramid.” She explained that the team went out there, gave it their all, and walked away with confidence of a victory. As the day began to wind down, the Boilers were beyond proud and motivated by their hard work paying off for first place, with Ball State coming in second, and University of Alabama-Birmingham coming in third.